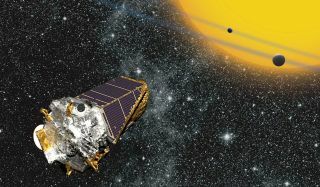 An artist's illustration of NASA's Kepler space telescope observing alien planets in deep space using the transit method. The space observatory has discovered more than 1,000 alien planets since its launch in March 2009. NASA's Kepler spacecraft has discovered its 1,000th alien planet, further cementing the prolific exoplanet-hunting mission's status as a space-science legend. Kepler reached the milestone today (Jan. 6) with the announcement of eight newly confirmed exoplanets, bringing the mission's current alien world tally to 1,004. Kepler has found more than half of all known exoplanets to date, and the numbers will keep rolling in: The telescope has also spotted 3,200 additional planet candidates, and about 90 percent of them should end up being confirmed, mission scientists say. NASA's exoplanet-hunting Kepler space telescope has discovered more than 1,000 alien planets, including the eight small, potentially habitable worlds here. Scientists announced Kepler's 1,000-planet milestone on Jan. 6, 2015. "Kepler was designed to find these Earth analogues, and we always knew that the most interesting results would come at the end," Kepler mission scientist Natalie Batalha, of NASA's Ames Research Center in Moffett Field, California, told Space.com last month. "So we're just kind of ramping up toward those most interesting results," she added. "There's still a lot of good science to come out of Kepler." The Kepler spacecraft has therefore been a revelation, and has helped lead a revolution. The $600 million mission launched in March 2009, with the aim of determining how frequently Earth-like planets occur around the Milky Way galaxy. The telescope spots alien planets using the "transit method," watching for the telltale brightness dips caused when an orbiting planet crosses the face of its host star from Kepler's perspective. "Before, we were just kind of plucking the low-hanging fruit, and now we're getting down into the weeds, and things are getting a little harder," Batalha said. "But that's a challenge we knew we would have." Kepler candidates must then be confirmed —by follow-up observations using other instruments, for example, or by rigorous analysis of the Kepler dataset. That enormous dataset has allowed researchers to study alien planets in new systematic and statistical ways. In 2013, for example, two different studies used Kepler data to estimate the percentage of red dwarfs — stars smaller and dimmer than the sun — that host Earth-size planets in their "habitable zone" (the range of distances from a star that could support the existence of liquid water). One study put the number at 15 percent, while the other calculated 40 percent. Even the lower estimate should cheer astrobiologists, for red dwarfs are the most common stars in the Milky Way, making up about 70 percent of the galaxy's 100 billion or so stars. Kepler has not yet discovered a true Earth twin — an Earth-size planet in the habitable zone of a sunlike star — but the mission is on track to figure out just how commonly these worlds occur throughout the galaxy, Batalha said. "I don't yet have a good sense of the completeness of the habitable zone; it could be that we will be sensitive toward the inner half of the habitable zone, maybe not the complete habitable zone," she said. "But I am confident now that we are going to get a number based on actual discoveries, and that we are not going to have to rely on extrapolation." Kepler's original planet-hunting campaign, which was designed to last for 3.5 years, called for the spacecraft to continuously monitor about 150,000 distant stars in the constellations Lyra and Cygnus. The data-gathering part of that mission came to an end in May 2013, when the second of Kepler's four orientation-maintaining reaction wheels failed, robbing the spacecraft of its super-precise pointing ability. A repair mission is not going to happen; Kepler orbits the sun, not the Earth. But Kepler is still observing the heavens. In May 2014, NASA approved a new two-year mission extension called K2 for the space observatory, during which a compromised Kepler continues to hunt for exoplanets but also observes other cosmic objects and phenomena, including supernova explosions and star clusters. K2 should spot a number of relatively nearby exoplanets that can be observed in detail by NASA's $8.8 billion James Webb Space Telescope (JWST), which is scheduled to launch in late 2018, Batalha said. While K2 observations continue, Batalha and other Kepler scientists are still busy analyzing data from the prime mission. NASA wants this work done by September 2017, and the team should meet that deadline, Batalha said. "Sometime around September of 2016, we'll probably have our final catalog," she said. "And then between September and January [of 2017], we'll be producing the products that will allow people to do the statistics with the catalog. And then we'll kind of write up all of our documentation and final papers, and turn off the lights and go home sometime around the end of summer 2017." But that moment won't mark the end of Kepler's contributions; NASA could extend K2 for another two years, for example. And even if the spacecraft shuts its sensitive eyes in 2016, its observations will keep researchers busy for a long time to come. "I fully expect that scientists will be working through Kepler data — and characterizing those planets and inferring various properties of exoplanets based on that data — literally for decades," Batalha said.